After a hair-raising docking at the crowded fuel dock and even tighter slip, we stayed two lovely days in the Osprey Marina, the entrance marked by an real Osprey nest high in a huge tree. It was the first rural stop in a while and we welcomed the peace and quiet. Our slip was literally across the fairway (20 yards) from a forest, much like any in Michigan. The trees are now pines and hardwoods, the forest floor has a variety of spring wildflowers and the cacophony of peepers, and birds look and sound much like Michigan but most fun were the turtles that came right up to the boat whenever we were on deck. I fought the urge to feed them with Sammy giving me the meanie look. We took some long walks, did laundry, enjoyed the people (Horizons and Best Day Ever) and great wifi. The dock hands here were smart and strong as we needed their expertise and muscle on the lines to get us out and on our way again even with little wind or current. More like Michigan every day! It was a short stay at the Myrtle Beach Yacht Club where we simply docked, took Uber to provision at Publix and were off again the following morning. It was a nice and friendly place where we would have stayed longer but our itinerary dictates that we keep moving to make the Looper Rendezvous in Norfolk by the end of the month. Very low tide. We brought a boat cart full of groceries down this ramp. The days have been chilly to downright cold when the wind is blowing out on the water. I keep layering clothes until we reach our destination and usually have a blanket or two on the bridge for the gusty, open stretches of water. It is always 15-20 degrees warmer once in the protection of a marina. I think we will wait in Norfolk for summer to catch up!! Thirty-six miles later, Southport was our next stop. Not only was it a top marina just prior to Cape Fear (more about that in a minute) but a great little town. As special treats, the first evening we were greeted by Kathy and Jack, a great couple who are friends of Pat and Heather and for whom Kathy was Lexi and Ashleigh’s Mrs. Heffelbower many years ago. Ash still visits her every summer. We had drinks on the boat and then dinner at Oliver’s, on the water, ending with the promise to meet again next year on our way through. The next two evenings we attended an ICW briefing by Hank Pomeranz and received perhaps some of the most important navigation and weather information of the Loop thus far. Hank is a meteorologist and sailor who through support of the marina presents every single evening for 60-90 minutes during Spring and Fall when Loopers are passing through. His handouts and websites would get us safely through the next 250 miles. Next best in Southport were the long walks, flowers, and sunsets! Spring Azaleas blooming for the past 1000 miles. Roses in high season alongside the Azaleas! Thank you Hank – what a guy! We set out early to cross Cape Fear, an inlet to the Atlantic, just outside of the marina and where the wind almost always blows. Now the name truly exaggerates the actuality, but historically, ships have wrecked here and thus it is a point of caution and concern, very near Cape Hatteras. Specifically, when the current (flood or ebb) is at its maximum, you can be carried up to 6 miles per hour without the engine (not recommended) and if the wind happens to be blowing hard in the opposite direction of the current, the waves increase such that the experience resembles white water rafting. Our experience was slightly uncomfortable but far short of any real concern. The good news is that it only lasted for about an hour and we were safely in a more controlled river. On to Harbor Village Marina. Now, there isn’t much to say here except it is a nice (read expensive) marina where the dockmaster and I were not on the same page as to the directions for entering his marina. Apparently, I was to call at red bouy such and such to report our arrival and to receive directions. Well, I never received that instruction, we were tired and challenged by a difficult day and annoyed by his denials, and we sat outside his entrance while several other boats were docked. We had a continuing little “conversation” about this throughout the docking process and I am embarrassed to report that neither of us could let it go until Captain Jim gave me one of his gentle eye rolls. Additionally, there was nothing nearby and the facilities (restrooms/showers/laundry) were 3/8 of a mile each way around the basin. The good news was that an Albin 36, Liquid Therapy, and looking just like us, was in the next slip. We had great conversations comparing our boats, their issues, interior decor, and future plans. At least 8 boats waiting for the bridge to go up. Camp Lejeune is a military training center that is bisected by the ICW. No kidding, they shoot at one another across the water. Above are examples of the cement tank targets that do give it a “real” feel. The procedure is to call ahead to make certain that there is no live-fire scheduled that day. As an extra precaution, they have lift bridges on either end of their territory to prevent stray Loopers from wandering into big trouble. Patrol boats and helicopters are everywhere. All of these quaint towns remind us somewhat of those along the shores of Lake Michigan. Beaufort, in particular, reminded me of pulling into the harbor on Mackinaw Island. We shared dinner with friends and their delightful adult children and, as a small world story, a couple from Frankfort, MI whose sister we met in the Frankfort marina three years ago as we departed on our Loop! Long story about how we put all that together! Picture of a picture but you get the idea of this harbor. It has been a travel slog up the coast of North Carolina and again, we must keep moving to reach Norfolk by the end of the month. Our final day of this blog entry was traveling the 36 miles from Beaufort to Oriental, NC. It was a beautiful Sunday morning and easy going most of the way until we reached the Bogue Sound. Again, this is an opening/inlet to the Atlantic and can get very rough with easterly winds which is what was happening. Fortunately the winds weren’t high and Jim figured how to keep the bow into the wind most of the time for a reasonably comfortable crossing. Delightfully, we arrived into one of our most favorite marinas yet. River Dunes in Oriental, NC. This place has history for us in that Jim took his captains course here some 10 years ago and has wanted to return. Here we are! The facility is five-star and the tiny town has the best women’s store yet, Marsha’s Cottage. Perhaps I was in the mood for some new clothes or perhaps the buyer has boaters in mind, let’s just say I went on a spree while Jim bought paper charts for the Chesapeake! I spent two hours in the hot tub, we have celebrated Elizabeth and Louise’s birthdays two evenings in a row over dock-tales and dinner along with Melody in Sea, Contentment, Total Eclipse, Ned Pepper, Nine Lives, Island Girl, Reflection, and Xtasea, . Today, raining and blowing all day long, we are enjoying two days to catch-up with ourselves in this lovely place. Spent one morning here all by myself! All birthdays are made special when you are away from home. Sammy Sayz: All good here but I just don’t get how occasionally the floor, or sofa, or bed move under me in unanticipated directions. It makes me jump. When I look around, nobody is there so I need to figure this out. Got any ideas? Also, my friend Mac is docked right next door and there is plenty of room nearby to run and be crazy. The other day somebody pooped on the dock, can you believe it? Boat Name of the Day: Ned Pepper – An interesting name to be sure but when asked the naming story, Tammy related the saga of being Canadian where you cannot register more than one boat under a name. They tried in vain four or five times to send in their registration paperwork waiting up to two months for the response that their selected name had already been taken. Mike, watching the John Wayne movie True Grit, decided that the character, Ned Pepper struck him as being their perfect boat name. Guess what, it quickly went through the Canadian registration system just before their departure on the Loop! Ashleigh (16) arrived on Thursday evening to spend the last of her spring break with us in Charleston – we couldn’t have been more honored. We Ubered to the airport in more than plenty of time to gather our wonderful granddaughter who had driven her Grandma Ollie and herself to the Detroit airport, parked the car, checked in, changed planes in Charlotte and arrived to us full of smiles. Back to the boat, Ash got settled in the v-berth and forward head. We were tired so all went to sleep early but not before what was to be a quick dinner in the Reel Bar. Well, this turned out to be a ghastly restaurant/meal experience. All orders were wrong, it took two hours to get our food and it was so noisy that we gave up talking. Turns out an already “happy” wedding party entered the bar just as we placed our order and the two bartenders could not keep up with the party drink needs much less deliver our food. Without even a verbal complaint and well received by us, the manic waiter waived our bill. We decided to spend our first day at the resort pool as this was to be our best weather of the weekend – 75 and sunny. We relaxed as we talked about school, hockey, skiing, shared past vacations, and Wednesday evenings gone by; read; and walked the nearby beach looking for crabs and finding washed-up jellyfish. Ahhhhh, this is what I needed! As promised we woke up to a cloudy Saturday and since the rain forecast was delayed until mid-afternoon, we took a nearby water-taxi the half mile across the Harbor to the Charleston Aquarium – a splendid display of the saltwater wildlife of South Carolina. Between beach exploration the day before and this aquarium, we truly came to understand Ashleigh’s young adult expertise and childhood passion for all animals – today it happened to be fish, fowl, and reptiles. Her dream is to be a vet for unusual/exotic animals and she is well on her way to making that happen. We then lunched at the East Bay Deli, the best deli in Charleston before taking a wet water-taxi ride back to the marina and an even wetter walk down the long docks to the Namaste. I cannot remember the last time I was drenched to the bone! Thanks to Jenny Lynn and Dan for the invitation to late afternoon snacks which turned out to be our dinner. Sunday was sunny but cold and windy so we took the hotel shuttle into downtown Charleston where we shopped the market and watched the Gullah ladies making seagrass baskets (see below). We lingered over the masks, metal figurines and jewelry before setting out on a long walk through the old homes, churches and shops of the South of Broad Neighborhood (the Pat Conroy book of the same name is highly recommended) and then along the South and East Batteries of this charming city. Ultimately, we lunched at a lovely little café in the French Quarter, hopped back on the shuttle and luxuriated in the hotel hot tub the rest of the afternoon. But you said you would bring Sammy. . .
Monday arrived too quickly and it was time for Ash to head back to the airport and home. We enjoyed a breakfast buffet at the resort Fish House, grabbed an Uber, watched her navigate the airport and that fast, she was gone. It has been quiet and a bit lonely for us all including Sammy who relished in Ash’s loving attention. Cannot travel when you’re hungry! . . .and that fast she is gone! Jim and I spent the rainy afternoon touring the World War II aircraft carrier, destroyer and submarine on display at the end of our dock and in which Ash had politely and respectfully declined any interest (good choice). We enjoyed seeing a real Corsair airplane upon which Jim’s dad had been a mechanic when he served on one of these enormous carriers but the experience was overwhelming and the ambience added to our overall sadness of Ashleigh’s departure. For the first time on this leg of our Loop we admitted to one another that it would be nice to be at home today but also knowing that tomorrow will be another day! Aircraft Carrier Yorktown from our fly bridge. Carrier and Destroyer. 3,500 men on one, 350 on the other! We had hoped to tour Charleston again but the weather was still yucky. Instead we were happy to provision at a local Trader Joe’s and less than excited to suffer through laundry at the outdoor machines before our departure early the following morning. Charleston is on our “return to” list! On our way again, we buddy boated with Melody in Sea to Georgetown. It turned into a day of skinny water and hyper-vigilance but no groundings, even though we saw under 5’ of depth a couple of times. The sailboat Namaste would surely have struggled here. Georgetown had come highly recommended and it more than lived up to its reputation. With a 2 mile walk each way, Sammy got a groom. A terrible haircut she thinks but neat, clean and smells good. I also decided to do something with my now straight, too long and oily hair. I will let the pictures tell the story but it does feel good to wash and go for now. The people, museums, shops and restaurants were first class in this lovely community. Most unusual bridge yet. Built on pontoons it is moved into place by boats whenever transport is needed across the AICW here. Cha Cha crosses her wake and we all celebrate! Visiting one of the lovely homes of Georgetown, SC. Great story and tour! The local high school was celebrating prom so the students and families gathered here for pictures. Amazing kids and clothes! Outside of Charleston our auto-helm decided not to hold course. This isn’t a major issue but being on the helm can be tiring without it’s help. After Jim and Dan tried everything they knew including moving the electronics bag away from the auto-helm’s compass, Jim called Raymarine and spoke with a guy in China (his new best friend, Lee) for over an hour until they successfully reprogrammed the settings. Today it worked like a charm – a one degree variance! YAY! Right now we am sitting in the Osprey Marina, just outside of Myrtle Beach. It was a tight squeeze to get in here and will be even tighter getting out but the spot is protected all around from what may be heavy storms. For the first time we are in an area with pines and hardwoods, no natural palms in the woods here but an orchestra of bird and peeper sounds with the biggest bee and wasps I have ever seen. Spring flowers are popping in South Carolina. We will stay for a couple of days because the slip fees are the best we have found – $1.00 per foot per night and the fuel is only $2.56 per gallon. We haven’t seen these slip charges since 2008 in the Great Lakes! Let me digress for a moment to tell you a little about the Gullah Culture created in the low-country of Georgia and South Carolina where we have spent the past two weeks. People were shipped from Africa, mainly Sierra Leone, West Africa, to be traded along this coast as slaves. During the hay day of the South the slaves developed a creole language and a culture rich in African influences that makes it and them distinctive among African Americans of today. Most importantly, although they did not receive any credit, they brought with them knowledge of how to make a valuable Indigo dye and how to cultivate rice in saltwater, both of which were the mainstays of the affluent southern economy until after the civil war. Because they experienced relative segregation and isolation living and working on rural plantations out on the coastal islands, they created and preserved their culture known as Gullah and their language known as Creole. The culture and these slaves have been of particular interest to me since Mike spent a year in Sierra Leone in 1989 and one of his mentors/friends, Joe Opala, has written extensively on the Gullah culture which he connects back to Sierra Leone. As with any slave culture, their history contains a sad and oppressive but proud element. Even Wikipedia today does not mention the important economic contributions they brought to the area. There is so much not written into our history books! It is reported that both Michelle Obama and Clarence Thomas are of Gullah descent. Sammy Sayz: I got an ugly haircut from a nice lady but it is getting hot and there are no mirrors so I am good. Mac and I had a good time together for the last week or so and I will miss him until we are together again in Norfolk. However I have the Pelicans, Ospreys, Sea Gulls, and Terns and now there are turtles everywhere with whom to make friends. Always so much to do when not napping! We spent a beautiful Easter Sunday walking the beach on Hilton Head, both of us agreeing that being away from family today was sad and particularly because everywhere we looked there were extended families enjoying the day together. We had a lazy morning remembering Easters-gone-by and then rode the Trolley to the Atlantic Beach for a long, luxurious walk. The trolley driver, Blue, with a personality bigger than the Trolley itself, watched and proudly shared a face-time call with her grandson all dressed up for church. (See quote below.) The remainder of the day we read and ate a traditional Easter ham dinner complete with deviled eggs. Decorative lighthouse on Hilton Head marking the 18th green of the golf course where the RBC is played this weekend. Note the tartan plaid. The next morning we rose early and left Hilton Head for Beaufort, SC. This had been one of my highly anticipated stops that didn’t live up to expectations. First of all, they (or perhaps I) messed up the reservation so that we didn’t have a slip so had to tie onto a mooring ball. In itself that is never a bad thing at about ¼ the cost. However, the fuel line (from the outboard motor to the gas tank) on the dinghy gave up the ghost and the engine, of course, couldn’t run without gas. Jim had to row us and Sammy into town and back several times a day. One direction was always against the current making a strong captain a plus in so many ways. We did enjoy a carriage ride explaining the civil war history and beautiful homes of Beaufort, and had a great lunch at Plum’s. Along with Savannah, we will return to Beaufort for a more relaxed visit next time. The final leg of the journey to meet Ashleigh in Charleston began on Tuesday. Since the most frequent question I am asked is, what is an average travel day like on the Namaste Too, I decided to record and write about April 3rd regardless of what happened, no matter what. So here we go, Beaufort, SC to Charleston, SC. . .
6:00 a.m. We arose in the pitch of night as we planned to go 63 miles today and anticipated bucking a current; made the coffee; got dressed and tidied up the cabins. 6:30 Jim rowed Sammy into shore not only in the dark but against the current coming back to the boat. Meanwhile I made a small breakfast. Easy going that way, coming back was the issue! Looks calm, doesn’t it? 6:45 Got the navigation tools ready, turned on the electronic instruments and started the engine. I email Curt our float plan for the day. This has two purposes, one is that someone always knows where we are and when we are expected to arrive. Two, at the end of our Loop, we will have a running log of exactly where we went and when. 7:00 Before sunrise but in enough light, Jim released the mooring ball as I navigated the Namaste through the mooring field toward the swing bridge just ahead on the AICW. Captain Jim took over the helm as I usually manage the deck by bringing bumpers onboard and coiling all the lines, making certain everything is ready for the next port. Sammy loves to help but any time we are working on the deck she is leashed up on the fly bridge, safe and out of trouble. She is immediately freed to roam when we are underway. An unexpected treat. We couldn’t have timed it better for this photo op. 8:00 Jo at the helm. We usually change “watch” every hour or so on long travel days. This morning we were heading East into a blinding sun. The dilemma is that it is miserable to look out at the water without sunglasses but it is next to impossible to read the electronic screens with polarized lenses. I wore my glasses on my head and my sunglasses on a chord around my neck, switching them back and forth as needed. Jim checked the engine room for any visible problem spots – there were none. In bright sunshine, we will likely have a warm and calm day. 9:00 Jim on watch. All is well in boat-world until the auto-helm lost its tracking ability. This is a GPS device that steers the boat on a set course under the watchful eye of the helmsman who makes adjustments as needed. This means one of us will have hands on the wheel all day which is not a huge issue but a nice convenience lost. Another thing to add to the Captain’s fix-it-list, says he’s on it. 10:00 Jo on watch. A couple of things to know here. We have three navigation aids going at all times – two electronic and one paper chart. My favorite helper is Navionics on the iPad. This is the electronic version of the most recent charts available and has a magenta dotted line as the suggested route through narrow channels and wide rivers. While following this line is absolutely not foolproof as the deepest water route, it is a good bet. I must also watch the depth gauge, rpm’s, oil pressure, and engine temperature constantly. Sammy reading Chesapeake getting ready for our visit there. 11:00 Jim on watch. For entertainment we are listening to NPR on a radio installed to the dash just like in a car. We are passed by three faster boats (Scandia, Final Approach and Rho Jo). This can be more complicated than one might think. The passing boat is required to hail the boat being passed on the VHF radio and request permission to pass on either port or starboard. Generally, the boat being passed requests a slow pass and then slows down so that the passing boat can get by more quickly. The problem is that the wake of the passing boat can tumble the boat being passed if he is going too fast (huge wake) or is so close that the boat being passed cannot turn into the wake quickly enough and takes the large waves on his beam (side). Usually all goes just fine, as it did with these three boats traveling together. However, there is lots to say about those who do not honor the slow pass, usually sport fishing boats but also big, expensive, go-fast boats. Recently we were passed quite close, without notice, by an expensive and beautiful Sabre whose name was No Rules – go figure. This is not necessarily dangerous but is mighty uncomfortable and can cause injuries to those on the boat being passed and can make a mess of the cabin if things aren’t meticulously stowed away. You can imagine what this is like for a small fishing boat anchored at the side of the channel or river!!! Anyway, we get over it and I make lunch of turkey and cheese sandwiches, cold veggies and lots of water. Maybe a cookie or too as well. We are about halfway through today’s route to Charleston. 12:00 Jo on watch. We hear on the VHF radio that a boat ahead, Final Approach, is experiencing a dripping leak. He goes back and forth with his boat buddy in Scandia finally deciding that it is a hairline crack on the intake manifold. What he needs is “magic tape” which holds anything and everything together until a permanent fix can be made. No one nearby has any such tape but since his bilge is keeping up with the slow leak, he pushes on to his next port – kind of like continuing to drive when an idiot light comes on. BTW, magic tape is on our list to purchase. When this all settles down, Captain Jim takes a nap in the comfy chairs behind the helm. 1:00 Jim on watch. While we have great conversations about everything under the sun during these trips, we also read; take notes for the blog; catch up on email and FB; clean the boat; cook; or mostly just watch the scenery go by. We have a system that if one of us needs the other up on the helm we give one quik honk the horn. 2:00-2:30 Jo on watch. We are nearing our destination of St. John’s Yacht Harbor where we have a reservation. This is a beautiful new marina near the mouth of Elliott’s Cut, a place to stage for going through tomorrow morning. Have I been mentioning about the really swift current? Well, Elliott’s Cut is only about 25 yards wide in one place and when the current is running in either direction it can reach 6 mph. This makes going slow, steering or meeting another boat a challenge so selecting passage at slack tide (least water movement) is advisable. Elliott’s Cut just prior to the most narrow section. 2:30-3:00 Jim on watch. He calls on the VHF radio channel 16 to the marina to get a slip assignment and some assistance with docking. There is a lovely woman on the other end of the radio with perfect directions of which boats to pass on what sides to reach our assigned slip which she reports is a port-side tie. This is important as by now I am on the deck attaching lines and bumpers at the appropriate spots for a perfect docking which we manage in a 3+ mph current and winds gusting to 23 knots on our beam and then stern as we approach the dock. Again, our confidence is building but getting complacent would be beyond foolish. We get the Namaste all nestled in her slip (adjusting and readjusting the lines and bumpers), take some deep breaths and head to shore to check in and find some grass for Sammy. Thanks for coming along on the ride with us! We managed Elliott’s Cut the following morning and crossed Charleston Harbor in some pretty stiff winds to reach the Charleston Harbor Marina where we will ready ourselves and the Namaste for Ashleigh’s visit tomorrow! Stay tuned. Quote of the day: Blue, our Hilton Head trolley driver, “they make it look so hard,” while shaking her head and smiling as she stopped for the out-of-practice bicycle riders on island rental bikes. We remained weathered in at Daytona for three days including two tornado warnings with rotating cells passing just north and south of the Namaste. We didn’t know anyone at the marina so it was a quiet time of walking the many docks, visiting a downtown trying to reinvent itself and observing a small, windy and cool wedding onboard a neighboring sailboat. The weather had turned from balmy Florida temperatures into what feels like Michigan in April – winds, rain, and cool temps – hence Summer turns to Spring. It occurs to us that perhaps we are moving north too quickly but granddaughter, Ashleigh, will meet us in Charleston during her spring break. These proud and excited grandparents will be there to meet her! Daytona – So many docks to walk, so much time! March 22nd we moved on to the River’s Edge Marina in St Augustine. This was a sentimental stop as Jim’s parents lived here and we visited during the mid-80s. Coming up the AICW (Atlantic Inter-Costal Waterway) we kept a “lookout” for something familiar that would remind us of where they might have lived. At some point I looked at a chart and the street Sandpiper jumped off the page at me as our answer. Because it was several miles out of town we postponed seeing the house until another time. We stayed in a funky marina off the beaten path (read as rustic and a twenty-minute walk into St. Augustine) where the local restaurant, Hurricane Patty’s was hosting their annual Rum Festival. Apparently, you pay something, get a green wristband and then are privileged to sample all the free rum you wish. Whatever the entry fee, we were sure not to get our money’s worth but Sammy managed a free biscuit and we all listened to loud music and raucous laughter well into the evening. The three of us walked over the bridge into St. Augustine two consecutive days. St. Augustine lays claim to being the oldest U.S. city, settled by the Spanish in 1565 but she also has a meticulously cared for and vibrant feel with spring flowers bursting everywhere. The Fort, located just north of town, gave Spain it’s stronghold in the new world but St. Augustine was frequently contested and flew seven different flags. There are literally dozens of wonderful galleries, delightful outdoor cafés, museums, cobblestone streets and carriage ride tours. My favorite spots were the Presbyterian Church with an old Spanish/ Catholic aura and the Flaggler Liberal Arts College, in the middle of town. Both are steeped in beauty and tradition! If I were 18 again. . .
A Presbyterian Church – Really??? The St. Augustine City Marina suffered damage from Hurricane Irma so had no power at most of the docks and was exposed to the Mantanzas Inlet making the mooring balls and marina uncomfortable in the high winds we were experiencing which made our choice of Hurricane Patty’s even more attractive. However, next time we pass through, that is where we will stay. Lila and Alan on Blue Haven came for an insta-pot meal as a payback we have owed since dinner on their boat in Faro Blanco two years ago. Because they are from Wisconsin we began planning our circumnavigation of Lake Superior for the summer of 2020! Friends and previous owners of Namaste Too, Jenny Lynn and Dan caught up to us here in St. Augustine and we had so much catching up to do that we shared docktails right through dinner and into the evening. Fernandina, the last city in Florida before entering Georgia waters. We were sad to leave Florida after many months boating here but then I have already mentioned our need to keep moving. Storms were predicted for late in the day (first 10 p.m., then 8 p.m. and then 4 p.m.) and we were making our longest travel day ever of 63 miles! Well, you guessed it, the winds caught up with us as we passed through Nassau Sound (Sound is another word for expansive inlets from the Atlantic Ocean) giving us what we call lumpy water followed by a downpour. Because high winds were predicted through the night and the next day we fortunately gave up our plans to catch a mooring ball and called the Fernandina Harbor Marina getting the last slip available in yet another marina damaged by Hurricanes Matthew and Irma. Captain Jim brought us to the dock through a narrow channel filled with boats in high winds and fast current but it was a great call! It blew and blew for the next 24 hours and those on the mooring balls were uncomfortable but safe. We were comfortable and safe. Fernandina is a lovely example of thriving, costal, small town living. The city provides a shuttle to all the important places including a Publix. We perused the wonderful shops and had breakfast at Bright Mornings Café and Bistro – not to be missed if ever you find yourself in Fernandina! We met a British couple who had come across the Atlantic in their sailboat (wow) and a Looper couple of some fame, Eddy and Linda of Eddy’s Weather Wag! Wonderful folks all! Worst weather day so far. Looking from the Namaste Too out to the Mooring Field. The small and damaged dock in the foreground protected us a little from the rocking waves. Mrs. Egret going in to buy supplies for supper. One of many unusual boats. This is an all aluminum boat flying a German flag! Screen shot of St. Andrews Sound. We are the red arrow in the middle navigating some pretty rough waters getting into Fernandina. Before I go further I must give you a few generalities about cruising and other things of Georgia. About 1 0 years ago we were vacationing with the Namaste sailboat on Beaver Island where I met a woman in the laundry who was doing the Loop, an adventure that was only a vague notion to me at the time. I remember asking her favorite place on the Loop (cannot remember her answer) but then her least favorite part of the Loop. I vividly recall her response as “boring Georgia”. I have been curious ever since and now we are here! Well, what I can tell you is that most of the Georgia inter-coastal is marsh grasslands with up to 12’ fluctuating tides and brisk currents. We did not find it the least bit boring but rather an opportunity to once again elevate our already soaring learning curve. All trips must be carefully calculated to go through the many skinny water spots (Jekell Creek, Hell Gate, etc.) at high or rising tide. This can lead to some pretty early morning departures or evening arrival times with occasional anchoring to wait out the tides. The goal being not to go aground but if you do, plan it for the rising tide meaning a shorter wait to get back on your way. In any 24 hour period there are two high and two low tides meaning that there are approximately 6 hours between the highs and the lows. All of this moving water causes currents that can literally push you around in small spaces and greatly varies the speed of your vessel. 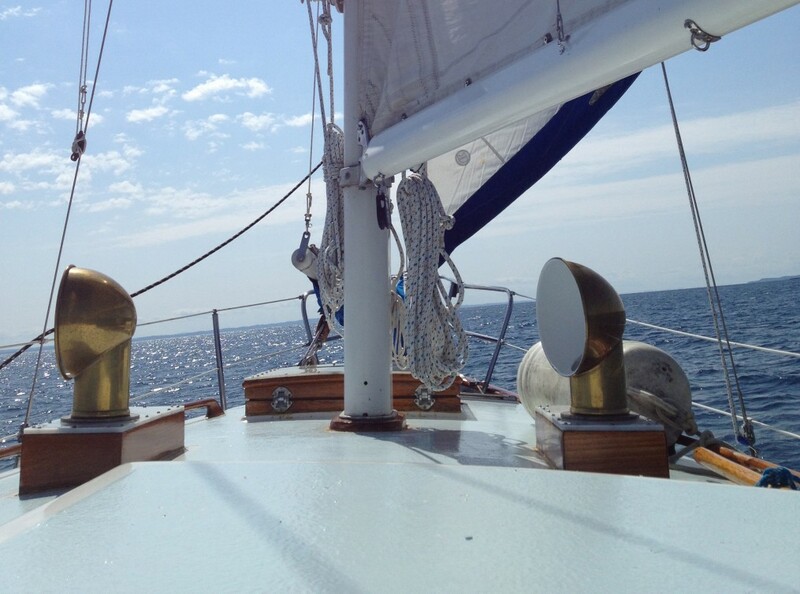 Our cruising speed is 7 knots but often found ourselves running at 5 knots or as high as 11! Makes timing things difficult. Slack tide or the lowest currents happen for the twenty minutes before and after each high or low tide, maybe. This is the easiest time to try to land your boat at a dock but often is not the case. There are charts and online resources informing you of the daily tide time changes, thank you to our Aye-Tide app! Many folks “go outside” into the Atlantic to miss all of this fun but we found the scenery and people to be perfect and welcoming. The Georgian Golden Isles as they are called, are one of the most pristine coastal areas of the Atlantic. A picture of the Salt Marsh Grasslands of Georgia. Dock gives you some perspective. OK, so now back to Georgia. We made it almost through on four long travel days. The entire trip consists of grass salt marshes which at high tide look like huge expanses of water but at low tide the winding path of the AICW is absolutely clear. In other words the experience is different depending upon the tide cycle. There aren’t any big cities along the coast of Georgia except Savannah and hence is sometimes called the Land In Between – the land in-between South Carolina and Florida. Our first stop was Brunswick Landing where we left our Tiguan a couple of weeks ago. This is a mile-long marina hosting some of the prettiest and most unusual boats. They have free beer on tap 24/7 and beer/wine happy hours on MWF for everyone. The laundry is free (a first) and town is a quick walk away. We got a great reception and then caught lines for 6 other Looper boats. Because we had a car we provisioned and did several errands over our two day stay. The Namaste getting a bath upon arrival at Brunswick. Salt covering everything. Leaving early on March 30 for Kilkenny Creek accompanied by Horizons, Lady D, and Houlegan, we set out on our longest travel day yet at 71 miles. The day was warm but the navigation tedious. Once again the winds were predicted to kick up to 25mph and we were tired so we opted for the Kilkenny Marina instead of nearby anchoring fields. Kilkenny is a fish-camp style marina that at the moment can accommodate 2-3 boats for power and the third (us) had to split a power line with Lady D.
Lady D ahead of us exiting Brunswick being greeted by a ro-ro ferry. The cars roll on and roll off! Kilkenny Marina with grasslands on the background and the beginning of southern low country. I digress, there are three different marina styles so far on the Loop. First and by far most usual, are the city or privately owned marinas that make their money selling fuel. The facilities are usually adequate and friendliness/services are usually outstanding. Second, are the resort marinas which offer all the luxuries inherent in staying at places like Captiva or Hilton Head. Third, are the fish-camp marinas that serve fishermen but also have dock space and an amenity or two: sometimes power, sometimes showers, sometimes a restaurant. Hoppies and Bobby’s Fish camp are other examples along the way. Kilkenny falls into this final category. We had dinner in the local restaurant eating shrimp looking out at the shrimp boat that delivered today’s catch bringing back images of the Forest Gump and Bubba adventures. Next day we were on to the Isle of Hope Marina. Delightfully this day would be only 23 miles and a respite from the long previous days. Isle of Hope is just south of Savannah and the most convenient place to stop when visiting Savannah. The other option is to navigate several miles up the Savannah River in heavy commercial traffic and stay in a marina unprotected from the freighter wakes. It is a brief Uber ride into Savannah but we decided to forgo this stop and pick it up on our return down the coast next Fall. We needed a rest and some slop days to make it to Charleston. A suburb of Savannah. The moss literally hangs on almost every large tree. So instead of Savannah we set out the next morning for a short day into Hilton Head Island. Again, this was a bit of a trip down memory lane for us. In June 1986 we vacationed here as a family in celebration of Pat’s graduation from high school. As it turned out it was 100 degrees every single day and Pat was diagnosed with mono on our departure day. While I am not sure of the boy’s memories of this trip, my stance is that we made the best of it by spending much of our time inside with air conditioning watching Pat sleep. Good food, a play and a little golf were also involved. We arrived in the Hilton Head Harbour Town Yacht Basin, truly a resort marina where we will stay for two days. Jim is reading or asleep up on the fly bridge. Last night we went to dinner at the Crazy Crab and caught the U of M Loyola final four basketball game. Today is Easter so we have rested and enjoyed this beautiful spot but are also missing home and family. This has been a fabulous leg of travel. We have increased our skills and confidence by ten-fold with this boat. Our only regret is that we didn’t anchor more due to the cold, winds, tide, and currents. Beautiful anchorages will be our goal for next time through here. Sammy Sayz: My preference would be to live permanently in one of those lovely Resort Marinas but short days without wind are OK too. Cold, windy days are the worst and every now and then the captain and other crew seem to think it is necessary to travel. I hate being down below in the noisy cabin close to the engine where it is warm so mostly sit by the captain on the fly bridge in my sweater and wrapped in a matching blanket. The best times are when I get to go run, run, run which I heard a lady call the Bishon Romp! Bad Boat Name: Flatline – I am pretty sure there must be a meaning other than the medical one, does anyone know? Quote: “God willing and the creek do rise, ” with regard to navigating Georgia! On the beautiful, if cool and windy, Wednesday morning of March 14 we departed Fort Pierce after a great six-week winter stay. Captain Jim easily maneuvering us out of a tight slip, onto a narrow fairway, to the current prone gas dock for a pump-out and then through the channel onto the ICW (Inter-Coastal Waterway). After several miles and a couple of bridges we looked up to see a gaggle of bright pink flamingos swoop down to lead our way. In awe, I reached for the camera too late to capture the moment but we recognized it as a good omen on our first run in 6 weeks. Our home-dock in Fort Pierce for six weeks. We are just below the tiled roof. We traveled from Fort Pierce to the Melbourne Memorial Bridge where we anchored alongside Sunset Delight. After taking Sammy ashore, we rowed the dinghy over for a nice visit with Ev and Clark, including supper of Chicken Alfredo created by Ev. It was a pretty evening and quiet but cold night. The temperature dipped to a 37 degree low and perhaps our coldest onboard since the river system in 2015. Where is this weather coming from? Sunset Delight by day. . .
Picture of the Namaste compliments of Gwen Klenk. Sammy Sayz, hey guys turn down the air conditioning! The next morning after Sammy had been ashore and I had exchanged a few texts with my childhood friend Gwen, she arrived to a parking place on the nearby bridge to take our picture. She waved us off to the Titusville Municipal Marina where they would later “show up” and drive us to a lovely dinner at Dixie Crossroads, a local specialty seafood restaurant. Our arrival at the Titusville City Marina was an intended stop in order to visit the NASA Kennedy Space Center the following day. We met Ev and Clark (Sunset Delight) early to Uber to the Space Center, a 30 minute and $27 ride each way. Now, I could go on and on about our experience but will let the pictures do the talking. Suffice it to say that all four of us, including two engineers, were impressed with the tour, exhibits, unbelievable videos but mostly the memories this adventure brought back of the 60’s space race. I remember watching on TV during my 10th grade geometry class as Alan Sheppard was launched down the sub-orbital Atlantic Range in 1961. To be within 50 yards of the two launch pads from which almost all U.S. rockets have lifted was chilling. I was happy to learn that all 144,000 acres that make up Cape Canaveral are also a wildlife refuge where nature coexists perfectly with the latest in technology. The NASA rocket assembly building. The dark gray vertical columns are the biggest doors in the world allowing the rockets to be assembled inside. They are then ever so slowly moved to the launch pads by a variety of very big vehicles with special roads. Launch Pad 39A. The fence in the foreground is to keep the gators and other ritters off the launch pad. Elon Musk’s Space X building right near launch pads 39 from which we watched two recent launches from Fort Pierce. A focus seems to be on blending the public and private sector efforts here at the Space Center. Makes sense to me! This is the massive rocket from which the Apollo program satelites were launched. These were returned to earth for reuse. A picture of a picture of the actual Apollo/Atlantis launch. Look familiar? This is the real Atlantis rocket that traveled 126 million miles in earth’s orbit. The entire ship was suspended inside a building and absolutely awesome to comprehend. Unbeknownst to us, it was Clark’s birthday so upon return to the marina, I cooked an impromptu chili dinner with Lorna Dunes subsstituting for cake and celebratory singing, sans candles. Sammy was so happy to see us after a long day alone on the boat that she took turns honoring everyone’s lap. Somehow she knows it is her job to make us all happy! A little weary, we stayed another day in Titusville resting, doing laundry, enjoying down-time on the Namaste and learning that Granddaughter Ashleigh is coming to meet us in Charleston for her spring break. This excitement resulted in some forward planning and our decision to move on to an anchorage in Daytona Beach. The beautiful weather, holiday weekend and lots of local boats created a busy waterway. Consequently we listened to Coast Guard distress calls on the VHF radio much of the day: 44’ sailboat taking on water, 7 year old missing in kayak, and rudder-stuck boat with no name or location. The sailboat was assisted and pumped out, the 7 year old found, and the rudderless boat call was eventually cancelled. High five to the Coast Guard! It is interesting to add that we saw considerable dock damage from hurricane Irma all along the way. At anchor just off the ICW channel, we bounced around until dusk when most boats began heading back into their slips and their owners home to prepare for another work week. Delightfully the ICW will be calm again reminding us not to travel on weekends unless necessary. As a side-note, there is always something to see when traveling on the water and here are a few of the memorable examples or at least the ones I captured over the last few days. Baby Dolphins playing. At one point there were five but I could never get more than one in a picture. One of many fishermen onshore at a narrow point in the waterway. Note his wheeled cart to the left in the picture. These are the norm for land-based fishing and clearly describe the personalities of their owners. Everything imaginable is onboard – all part of the gear! Our plan had been to get up early and head for St. Augustine the next day. Upon arising however, a check of the weather indicated otherwise. Storms were predicted to begin in 90 minutes and last all day. I quickly called the nearby Daytona marina and secured a slip. However, the 90 minutes shortened to about 15 minutes and we got hit hard with rain and wind causing us to stay out in the ICW and not attempt a docking until the weather passed. After about an hour, things settled down and although wet, Captain Jim safely pulled into slip E18 of the Halifax Marina, the second largest in Florida. When the rain finally stopped I spent much of the day getting things dried out between storms and Jim cleaned the mud off the deck, anchor locker and chain. It was a real mess but is sparkling clean now. We have been working on our boat lighting situation by adding a motion sensor solar light outside the cabin door to light our way onto the boat after dark. He also installed the new LED bulbs ($5/each!) in most of the overhead and engine room fixtures so that it is not only brighter in here but the LED bulbs use considerably less amperage when we are on battery power at anchor. I also ordered a cute nautical lamp that missed us by a day at Fort Pierce so friends stowed and will deliver it when we meet again. Clothes and towels drying in the head. A clean anchor chain in an even cleaner chain locker. On our second day in Daytona Halifax Marina we woke up to very cloudy skies and threats of storms and high winds all day long! As we were getting ready to Uber to Publix about 9 a.m. my cell went off with warnings that tornados were in the area. The marina restroom building is pretty but structurally made of 2X4s and a metal roof. Thus, we high-tailed it over to a new and large brick office complex building where we took cover at the Freedom Boat Club for an hour. One tornadic cell went just north of us and another just south but we got only rain. More storms are still predicted for later today. A shout out to Scarlett and Allison of Freedom Boats for their hospitality during the storm. Established in 1989 with approximately 156 franchises around the country Freedom offers their members the utilization of beautifully maintained boats (pontoon, center council and run-abouts) in any of their locations. We have now seen them in several marinas and they are a great option for anyone who wants to boat on vacation but not have the year round care and expense of their own boat. We learned that there is a brand new franchise in Charlevoix! Thanks again Scarlett for the shelter and letting me sit in your lovely lounge using your internet to shop amazon and post this blog! I have almost forgotten what fast internet is like! The storm is acomin. . . Even with busy waterways and storms it feels good to have a plan and be Back on the Road Again! Congratulations to Lee (with the beard) on his lead performance of Marius in the Steiner school play, Roma Amore last week! These events are so hard to miss. As you may know, there is a long-held superstition surrounding the renaming of boats stemming from the belief that renaming removes the soul of the vessel which greatly displeases the Gods. Only with strict adherence to the renaming ceremony may we appease the Gods, Poseidon (God of the Sea who has each vessel listed on his ledger of the deep), Neptune (Roman God equal in nature and power to Poseidon) and Aeolus (God of the winds and storms, and the most important of the boating Gods, as we well know). The renaming ritual not only appeases the Gods but provides security and the humble sense of a higher power. Historically, the ceremony was a combination of religion and superstition, now more a social event. Only the Captain and Crew may be aboard a vessel as she is renamed. Thus, Captain Jim, Sammy and I performed the ceremony from the bow with invited and honored guests remaining on the dock with wine (water, beer or whatever) in hand. Guests were requested to raise their glasses on cue and shout AVAST (pirate language for cheers) but otherwise to remain silent in respect for the solemnity of the ceremony. First, we commenced with the De-Naming Ceremony. Poseidon, Neptune and Aeolus, oh mighty and great rulers of the seas and oceans, to whom all ships and we who venture upon your vast domain are required to pay homage, implore you in your graciousness to expunge for all time from your records and recollection the name “Gypsy Spirit” which has ceased to be an entity in your kingdom. As proof thereof, we submit this ingot (Smuckers jam jar cap) bearing her name (Gypsy Spirit inscribed in marker) to be passed through your powers and forever to be purged from the sea. (Ingot is dropped from the bow into the sea). In Grateful acknowledgement of your dispensation, we offer these libations to your majesties and your court. (Wine bottle is opened and half of the bottle poured into the sea beginning in the east and moving to the west). AVAST! A shame to pour perfectly good $5.99 red wine overboard! Second, we commenced with the RE-Naming Ceremony. Poseidon, Neptune and Aeolus, oh mighty and great rulers of the seas and oceans, to whom all ships and we who venture upon your vast domain are required to pay homage, implore you in your graciousness to take into your records and recollection this worthy vessel hereafter and for all time known as the Namaste Too, guarding her with your mighty arm and trident and ensuring her of safe and rapid passage throughout her journeys within your realm. AVAST!! Oh mighty rulers of the winds, through whose power our frail vessels traverse the wild and faceless deep, we implore you to grant this worthy vessel, Namaste Too, the benefits and pleasures of your bounty, ensuring us of your gentle guidance according to our needs. AVAST!! Great Boreas, exalted ruler of the North Wind, grand us permission to use your mighty powers in the pursuit of our lawful endeavors, ever sparing us the overwhelming scourge of your frigid breath. AVAST!! Great Zephyrus, exalted ruler of the West Wind, grant us permission to use your mighty powers in the pursuit of our lawful endeavors, ever sparing us the overwhelming scourge of your wild breath. AVAST!! Great Notus, exalted ruler of the South Wind, grant us permission to use your mighty powers in the pursuit of our lawful endeavors, ever sparing us the overwhelming scourge of your scalding breath. AVAST!! And to the greatest of all, might Aeolus guardian of all winds and all that blows before them, we ask your favor and kindness for fair winds and smooth seas for all Loopers and mariners as we humbly pass through your kingdom. AVAST!! At this point the name Namaste Too, affixed to the stern of the boat, was unveiled to cheers and toasts. Let the party begin! And the Name is unveiled. Sammy is more interested in her friends on the dock! A few other interesting events of the week included a tour through the A. E. Backus Art Museum and Gallery here in Fort Pierce. On display was a collection Highwaymen art. In the mid 1950’s a group of 26 African American artists started a business venture centered in Ft. Pierce where they sold their work from the trunks of their cars. Named the Highwaymen, their art wasn’t accepted into the galleries of the time so they traveled the roads selling their work. They captured Florida’s beauty in a colorful vision of “old” Florida. A. E. Backus was an early mentor of some Highwaymen and was thus credited with being a supporter of this great American success story. On one of our long walks, Nancy and I saw the Peacocks that free range on Orange Street in Fort Pierce. It is our guess that the birds were once the “pets” of one or more of the gracious old homes on what had been a quiet street. They now clearly have the right of way, crossing the road at will. Mr. Peacock didn’t present us with his colorful fan-tail today! On a sad note, one of the many charter boats in the marina experienced an explosion late last Saturday afternoon. The details are sketchy but in the words of another boater – “fumes and sparks”. The nearby boats with captains a”Maboard were flying out of their slips and the entire marina was a hive of frightened excitement. The local fire department put out the fire under the watchful eye of the Coast Guard but not before it burned to the waterline and a neighboring boat was scorched or perhaps a better word is melted on the entire exposed side. One official report said that two people were taken to the hospital with burns but we understand these were not life-threatening. Boat fires are scary business! As a final task, we drove our cars north about 300 miles to a marina in Georgia called Brunswick Landing. In tandem, I drove the Tiguan, Mike drove his car and Jim the rental car with us all in the rental car for the return trip. I am guessing that we each enjoyed the 5 hours of completely alone time in our vehicles. Nancy had the full ten hours alone on her boat while babysitting the dogs and making us a wonderful dinner. This marina is a safe place for the cars until we arrive and decide what to do with them next. Stay tuned for departure. . . Cute Story: When Cedar was visiting he and Jim had an interesting exchange. Cedar (2) has been in a full immersion Spanish Daycare/School for about a year. At some point he and Jim were alone and he was behaving a little whiny (imagine that from a two year old?). Anyway, Jim chose to ignore him. This went on for awhile until Cedar became frustrated with being ignored and switched to Spanish, obviously believing that Jim wasn’t understanding him! I wish I had been there! We Win When February is Fantastic! This blog entry highlights a visit from our youngest son Curt, Brooke, Leonie (5) and Cedar (2) – the camp family. They stayed almost a week: sharing time, fortifying our relationship with the kiddos and adding preschool energy to the Namaste. Leonie and Cedar loved living on the boat while Curt and Brooke relaxed in the evenings and worked in the mornings in a nearby hotel with a beach and pool – perfect set-up for all! The pictures tell the story so I will leave it there. or maybe the dinghy is better? or three trips to the ice cream store in 24 hours! As you can imagine, we loved having everyone here. However, our re-entry has mirrored re-entry after any vacation – a lot tired, a little sad but mostly filled with gratitude and great memories. Sammy is still recovering. On the winning side, Nancy has nominated and conferred upon us the most February visitors award! Life in Fort Pierce continues to more than fulfill our expectations. In fact, we believe that Hutchinson Island and the “Treasure Coast” are a well-kept Florida secret. This three county section of the Atlantic Coast was likely named in an effort to distinguish it from Miami and the “Gold Coast” to the south. Historically, the discovery of treasure from the 1715 Treasure Fleet lost in a hurricane near the Sebastian Inlet, was of major local importance and brought international attention to the area. Visitors continue to search the beaches for washed-up treasures! As for real life, I am enjoying (that might not be exactly the right word) my jazzercize class on MWF at the Veterans Community Center. No Judy and Maureen, it will never take the place of our great walks around Dunham Lake. Speaking of exercise, I try to walk 10,000 steps every day. The report per my Fitbit for last week was a commendable a 69,992 steps, just eight steps short!! I’m crediting life with a two year old as the secret to success! We enjoy the wonderful beaches, particularly in the early morning and late afternoon but also when the wind is up and the surf comes crashing in. The inlet/jetty between North and South Hutchinson Islands is a happening place if you like boats, funky restaurants and people watching. Another local and literal treat is the S & S take-out. This tiny operation creates 3 gourmet entries ($8-12), several salads and desserts each day, posts them online and has them ready for pick up just before dinner. Love it! It wouldn’t be a blog post without boat updates and repairs (emergency and otherwise). The morning after the “kids” left, the aft cabin head (toilet to non-boaters) began to malfunction (emergency). Boat plumbing is a nightmare of the highest order, second only perhaps to electrical problems. I will spare the gruesome details but a quick check of YouTube, two trips to the hardware store, buckets, tools, gloves, lots of paper towel and three hours later all is good – except that there is another head in the forward cabin just waiting for an inconvenient moment! BTW, the plumbing fix needed was a new “joker valve”, not funny! Another maintenance necessity (scheduled) was having the boat bottom cleaned. For those of you familiar with fresh water boating this would never be a problem but here in Florida, everything imaginable clings to and then grows on the bottom of your boat. We hired two divers to go below and scrape the bottom clean – a job you might imagine when your 9-5 is getting you down! YUCK! The good news is that the zincs (sacrificial material that protects underwater metal parts) are still 70% serviceable. Quote of the day: “Oh no!” -Jo Ann upon realizing today she had sent a significant Amazon order to Faro Blanco Marina in Marathon instead of to the Fort Pierce Marina – a consequence of hitting the “buy with one click” Amazon option. CONGRATULATIONS: Lady Mavs (Milford High School downhill ski team) for taking 4th place in the State behind Marquette and two Traverse City teams. I also understand that Klava is lighting up the basketball court while Lee has the lead in his school play next week – break a leg!